Hello and Happy Hump Day! We made it to mid-week so Woo Hoo! Hopefully it's been a good week for you. So far it seems like I'm going to have to cram 5 days of work into 4 since we were off on Monday. But I really think being off work a day was worth it! 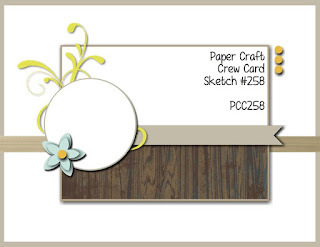 Since it is Wednesday, that means it's time for a new Paper Craft Crew Challenge. This week's sketch is super cute! 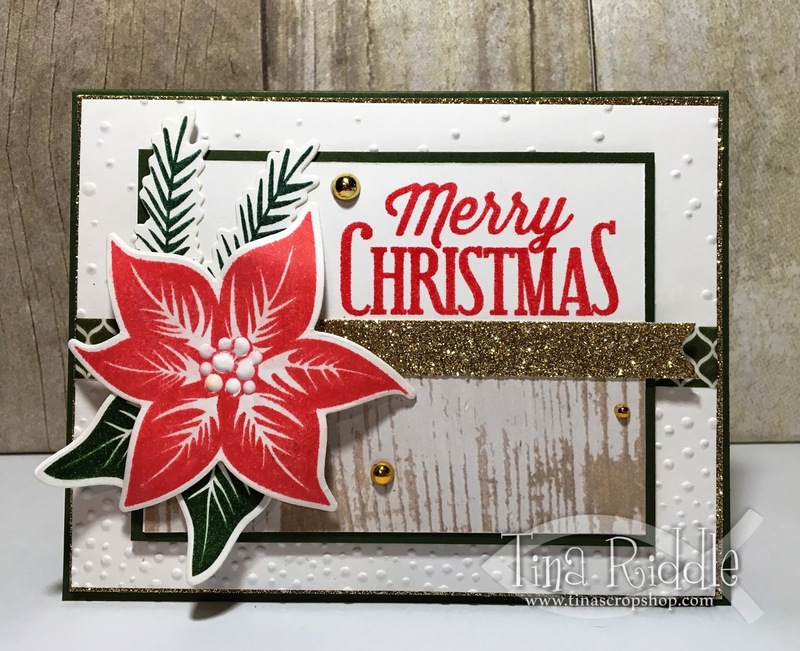 I decided to try as much as possible to get Christmas Cards made early so I took this sketch and an awesome FSJ Stamp Set called Poinsettia Burst to knock one out! I started with an A2 Card Base made of FSJ Frest Forest Cardstock. I added a thin layer of SU Gold Glimmer Cardstock. My next layer was FSJ Whipped Cream Cardstock that was embossed with the SU Softly Falling Textured Embossing Folder. I ran a piece of green and white washi tape across it and tucked it behind each of the sides and then added it to the gold layer with foam tape... It's a little hard to adhere to the Gold Glimmer Cardstock so I felt the foam tape was a safe option. My middle panel was a piece of FSJ Whipped Cream Cardstock that measured 3 7/8" x 2 7/8" and was matted with a piece of 4" x 3" Fresh Forest. I cut a small layer of distressed wood paper from the SU Wood Textures DSP stack for the bottom of the center layer. 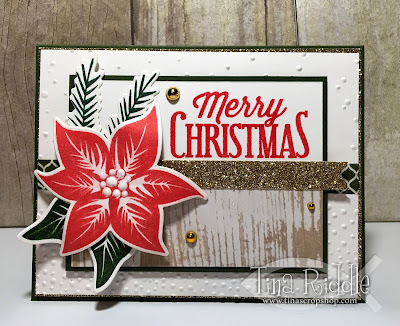 I used my Misti to stamp the Merry Christmas Sentiment from FSJ Holiday Wishes Stamp Set in FSJ Candy Apple Ink. My poinsettia was also stamped in Candy Apple Ink onto Whipped Cream Cardstock. The leaves for the poinsettia were stamped in SU Garden Green Ink and the Pine Boughs were stamped in SU Emerald Envy. I used the coordinating dies to cut them all out. I added a little Clear Wink of Stella to the poinsettia and then attached everything to my middle panel with Foam Tape. I added some Nuvo Crystal Drops in Simply White to the center of the Poinsettia. Finally I added some Gold Metallic Dots to finish this one off! Well that's it one more Christmas card down! Yay me! !